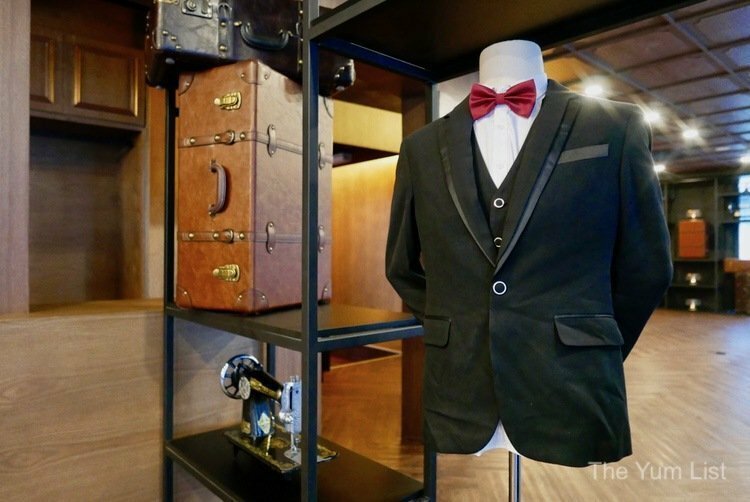 As Monica and I somewhat tepidly make our way into what appears and is in fact, an operating high-end suit tailors shop, I get a rush of excitement in my stomach about what is to come. 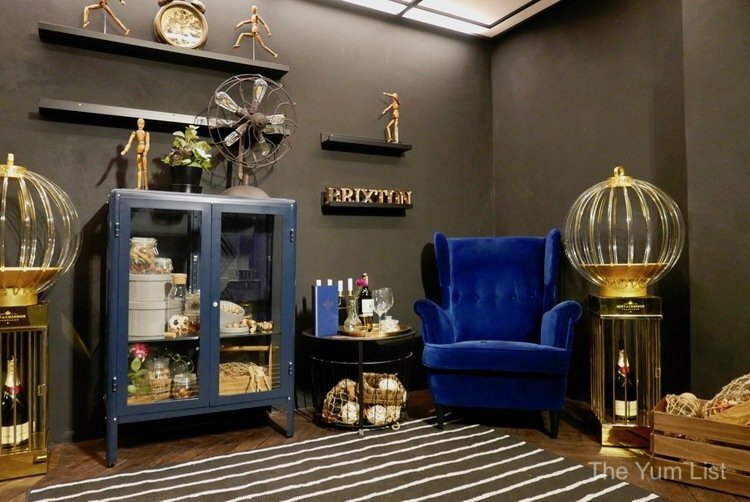 KL is a city that never ceases to surprise and Brixton 23 is the perfect example of the glamour, intrigue and excellence that our city seems to be able to offer at every turn. 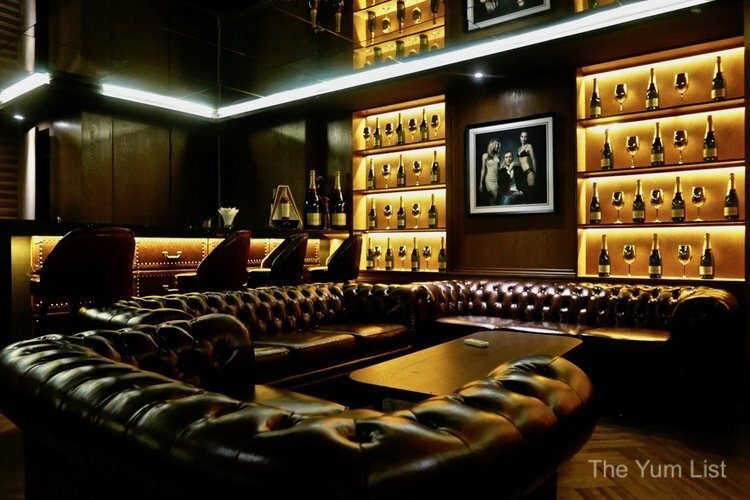 Located on Jalan Sultan Ismail, Brixton 23 is a superb speakeasy restaurant and bar that is themed after the iconic secret intelligence movie The Kingsman. As we move through the tailor’s office through a hidden door and down a staircase, I am stunned when I catch my first glance at the space. Despite walking under the tailor shop, the space opens up to a multi-levelled restaurant and bar with a full glass roof allowing for natural light to flood in and beautiful views of the city to be admired. The style and décor of the place are impeccable. The old-style British elegance is clear with the bottles of whiskey on display and gold and brass details on the bar. Yet the mysterious spy energy is in full force with secret private rooms, which can be booked out for parties and events. 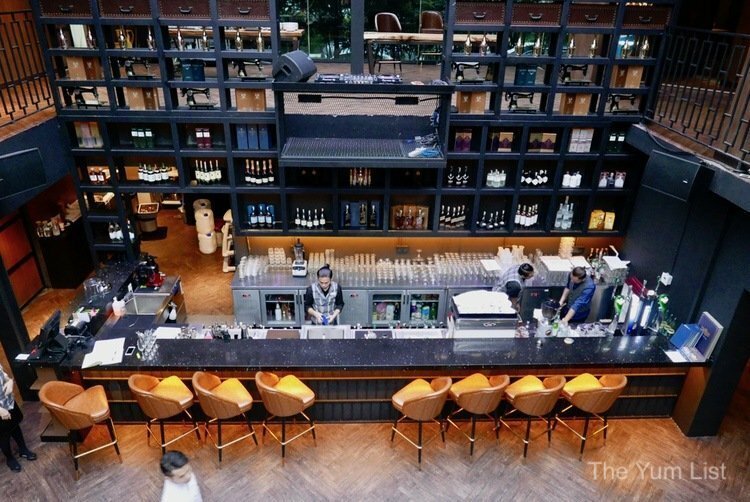 A full-on speaker and DJ system looming on the second floor above the bar gives the bar a youthful, chic energy. Brixton 23 certainly does not sacrifice quality and as we settle at our table and peruse the menu, it is clear that over the course of the evening all of our senses will be tantalized. A spy is only as good as their signature cocktail (shaken not stirred anyone?) and so we begin our evening by sampling some of the many impressive signature cocktails on offer. 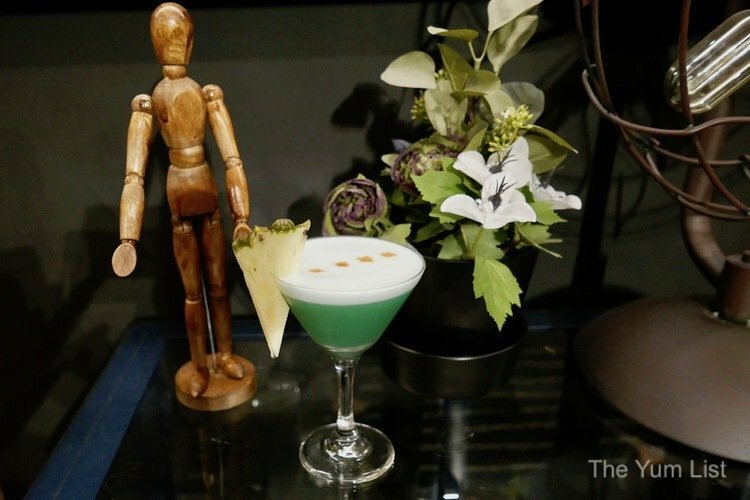 We slide right in with the namesake of the theme, The Kingsman (RM 55) cocktail first. This highly aromatic drink is made with cinnamon infused whiskey, Scotch whiskey and a myriad of citrus juices including lemon, lime and orange and a grapefruit purée. It’s no doubt highly citrusy with the whiskey adding a spicy, smoky finish. A little bit lighter, The 23 (RM 48) is made with rum and triple sec with the pineapple juice being a dominant flavour. This tropical drink combines the citrusy flavours with egg white to create a creamy finish and a well-balanced cocktail. Our final cocktail is the most playful of them all. 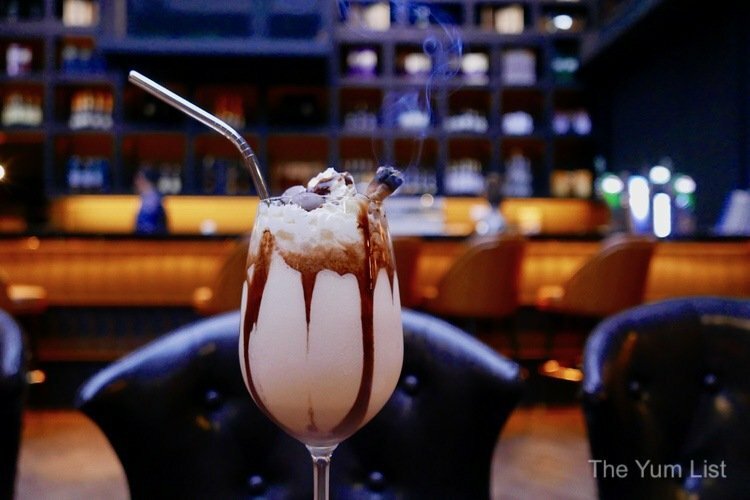 Named after the main character in The Kingsman film, Eggsy (RM 48), it’s an adult version of a milkshake! Those looking to indulge will love this vodka, Bailey’s and milk drink topped off with a Snickers or Milo bar. 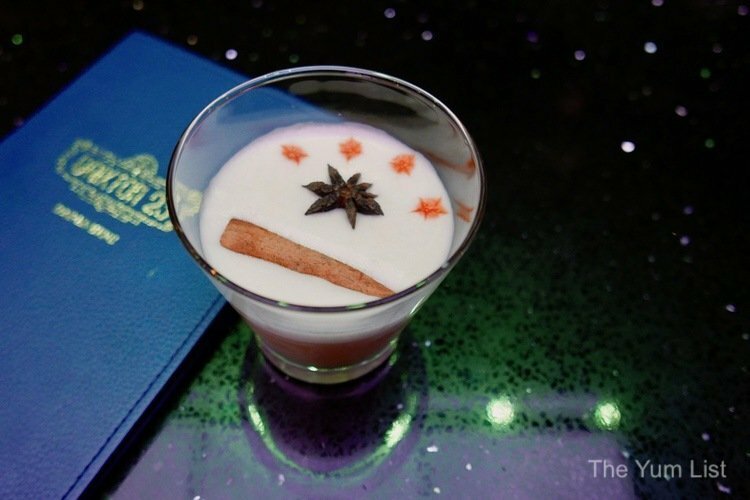 The torched cinnamon garnish adds flair and sophistication to this whimsical cocktail. With the cocktails having warmed our bodies, we relax into the evening as the day turns to the night and the speakeasy turns a little darker and a little more bewitching. For dinner, we choose a selection of white wines to accompany our meal. 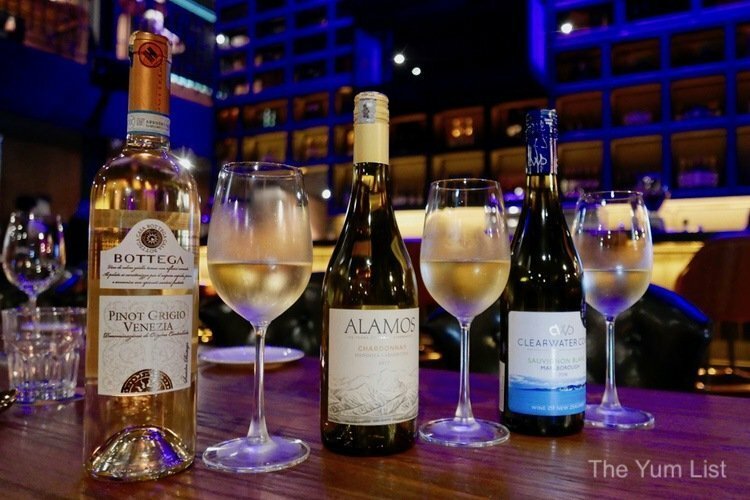 This evening we sample a Bottega Pinot Grigio Venezia from Italy (RM 35 per glass, 140 per bottle), a Catena Zapata Alamos, an Argentina Chardonnay (RM 45, 150 per bottle) and Yealands Clearwater Cove – a delightful New Zealand Sauvignon Blanc (RM 42, 145 per bottle.) Each of the wines is a classic representation of house pours of their designated grape and we thoroughly enjoy sipping them as we are introduced to the menu and chef at Brixton 23. Justin Yap is the head chef, and at just 25 he is a young, yet experienced new face in the KL culinary scene. 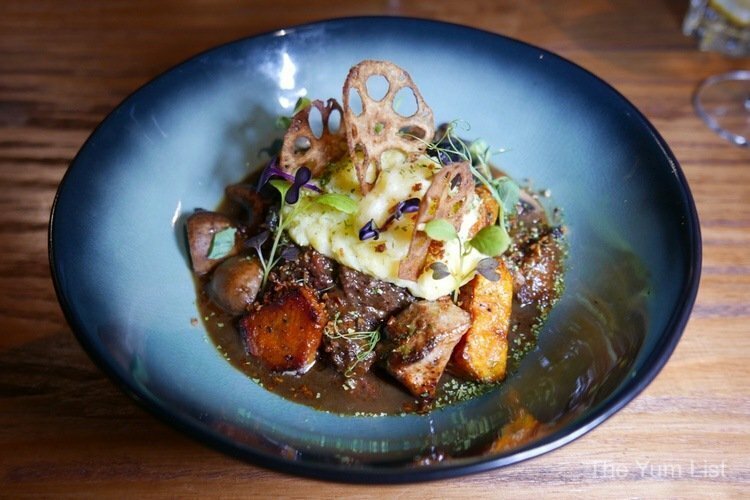 He describes the menu as a hybrid between Asian and western flavours, in particular, French and Japanese. Although he has not limited his team to just those cuisines. Instead, he allows freedom to make anything they think will be enjoyed by diners. We start the night off with warm house-made bread that is moist and soft and perfectly seasoned with Italian herbs. 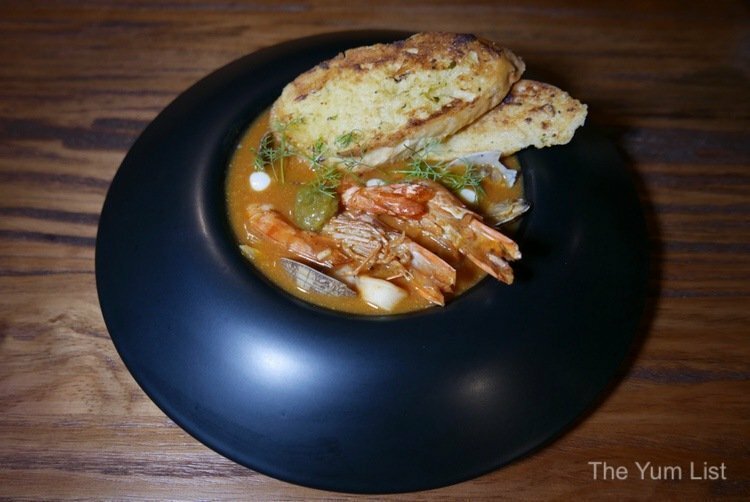 For appetizers, a juicy Pharaoh’s Bisque (RM 42.8) was served with tiger prawns, poached Uzu clams and chunks of tender grilled brown cod. The seafood was soaked in an Asari clam bisque and finished with cream to give the sauce a slightly thicker texture. The toasted garlic bread served with it was perfect to lap up the extra bits of the delicious sauce. One of my favourite dishes of the night followed the Caprese Modern (RM39.8). 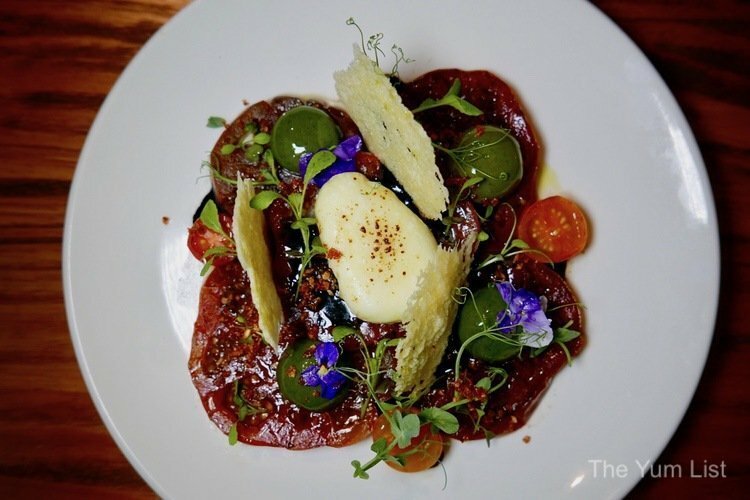 This modern take on a classic salad included sweet and thick locally grown heirloom tomatoes, fresh buffalo mozzarella and my favourite part – pesto that has gone through spherification. Slice into the little green ball and pesto flows out! With that and the Parmesan-crusted biscuits, my millennial Instagram food aesthetics have been satisfied! Adding a little local flair to the evening were the satays, a huge hit. 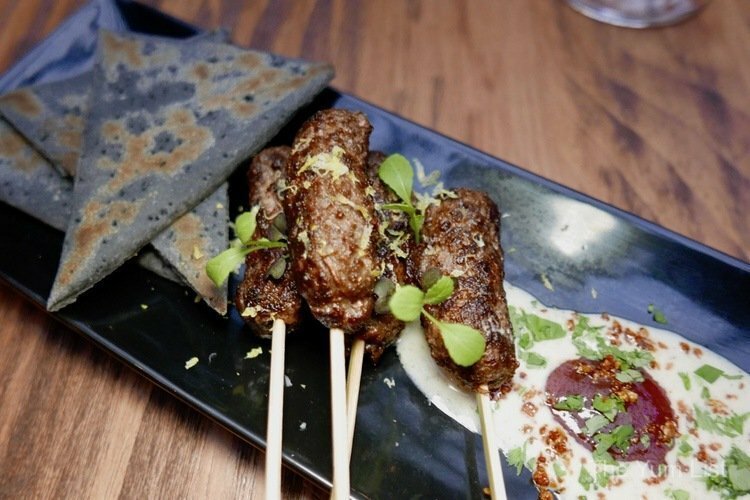 The Lamb Masala Skewer (RM43.8) was served with a charcoal bread and had the perfect fattiness on the outside of the lamb, with the meat itself being juicy and spiced to perfection. The yoghurt, citron dressing acted as the perfect compliment. Our final starter was the Seared Hokkaido Scallops (RM 78.8). The quality of these handpicked winter scallops from Japan was divine and evident in the way they held flavour and their texture. Topped with Jerusalem artichoke purée, cauliflower and fennel and onion crudo, this is a standout dish. Simply delighted by the appetizers and starters, I cannot wait to see what is in store for the mains. For pasta lovers, we recommend trying Brixton 23’s Carbonara Tartufo (RM 39.8). This unique dish is made ravioli style and is vegetarian. 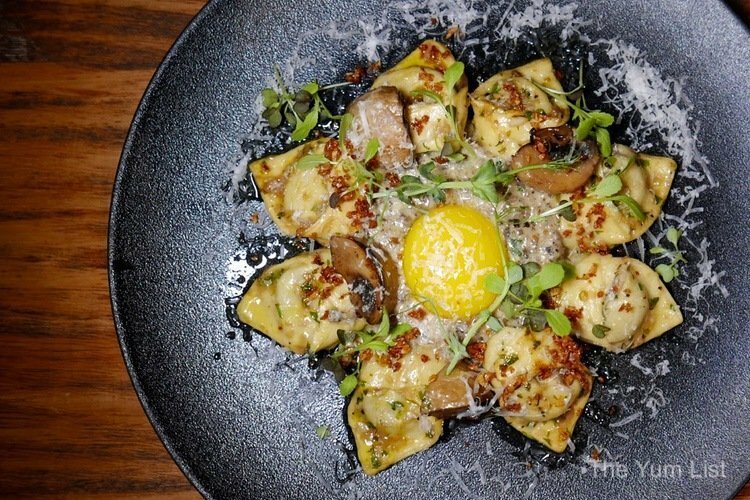 The ravioli is stuffed with egg yolk that has been cured in Bonita salt for five days and local Malaysian black mushrooms. The pasta is firm standing confident against the strong flavours of shaved Parmesan and black truffle, which forms the base of the sauce. 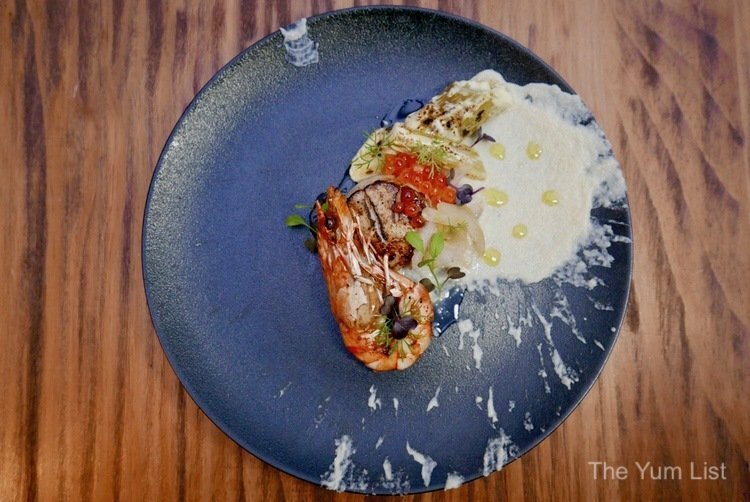 Smoky, creamy and unique, this dish shows off the culinary team’s creativity and playfulness when it comes to renditions of old classics. 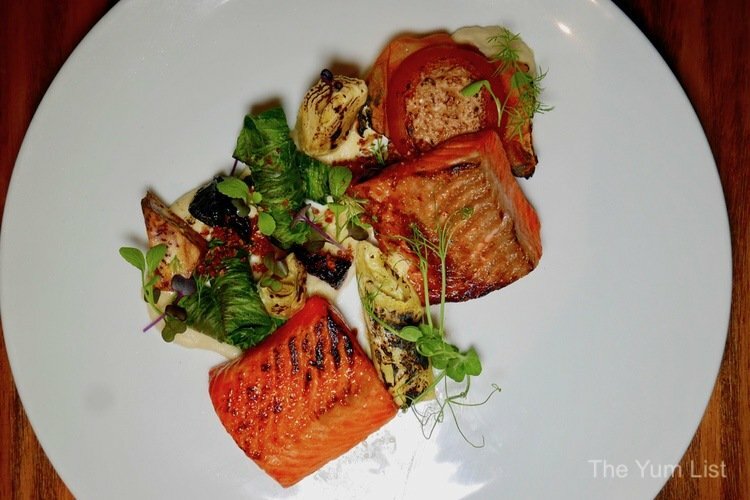 Seafood lovers must try the Charred King Salmon (RM 62.8). This aromatic dish is grilled over Gabon wood and stuffed with tomatoes and homemade mayo making this a rich dish. The fullness of flavours in the salmon is complemented by the citrus lemon butter sauce and the lightly herbed butter root vegetables on the side. Finally, all meat lovers out there must put the Century Braised Beef Cheek (65.8) on your list of must-tries. This Angus beef cheek is so tender it falls apart at the fork and quite literally melts in your mouth. Made with a pinot red wine reduction and a pomme purée and mushroom jam the flavours in this dish are intense. It is very rich so we recommend it as a sharing plate for those at your table! Stuffed to the brim, I don’t know how we do it, but we always seem to find room for dessert. I am glad we do because truly what’s in store for us is a treat. In keeping with the glamorous feel of the place, The Rocher (RM 48.8) is a roasted hazelnut and Valrhona chocolate mousse with caramelized nuts that are literally dusted in 24-carat gold edible dust! 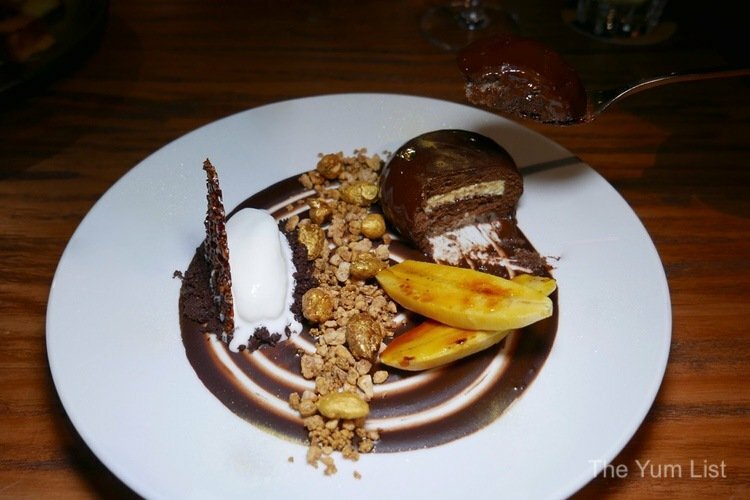 Coming with a side of tiramisu gelato and roasted sweet bananas, this dessert is the definition of boujee indulgence! 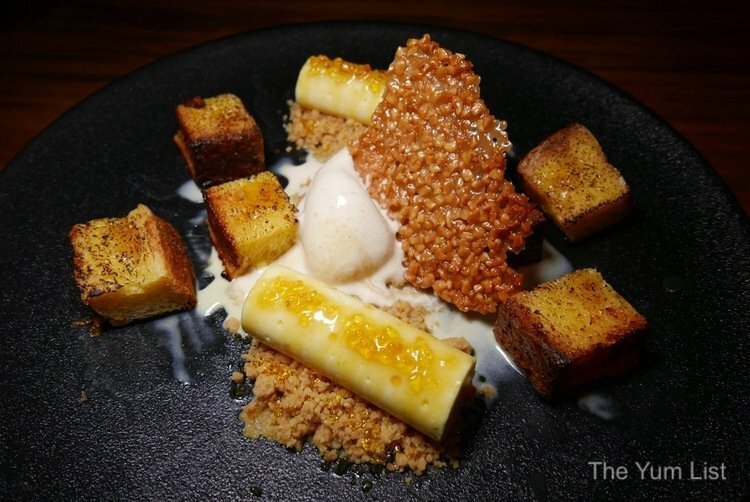 And finally, in what felt like a homage to my Canadian roots, the Smoke House Cabin (RM 35.8) was an extravagant French toast served with Canadian maple syrup cheesecake and smoky vanilla gelato, which complemented the maple flavours and brown butter on this dessert toast. A sweet way to end an unexpected, yet marvellously bold and enticing, not to mention delicious evening. 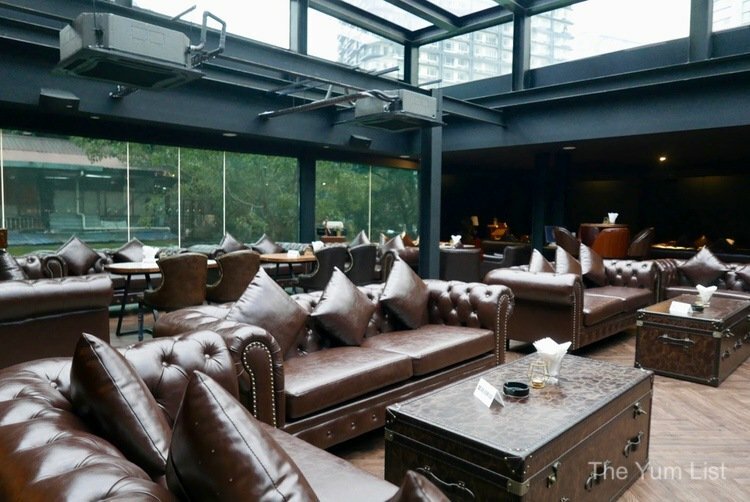 Check out more of KL’s exciting bar scene here. Lots of lovely antiques, this place. I love the plush accommodations and that point of view showcasing the towering backdrop of the bar!! A great place for friends to spend quality time! Interesting concept. Love the interior design and decor. The kingsman. I watched that movie. The decor is very masculine.